Left to right: John Ingram, Colin Wood, Chassey Findlay, John West, Derek Mair. John Ingram, William John West and Derek Mair have dedicated themselves to the Macduff lifeboat crew, taking part in dozens of challenging and daring rescues. They have now been honoured for their long service at a special ceremony in Banff. Mr Ingram joined the team in 1985, and decided to step down in December after 33 years. Mr West was the harbour master at Macduff when he joined in 1986, and became honorary secretary of the station. Mechanic Mr Mair, meanwhile, has stepped down after two decades of service. Roy Morrison lifeboat operations manager at Macduff said the “dedicated” trio had all played an important part in keeping the waters of the Moray Firth safe. He said: “The RNLI has a long and proud history of saving lives at sea along the coast of north Aberdeenshire and we couldn’t do our lifesaving work without dedicated volunteers. “Collectively these three guys have dedicated 85 years’ service to the RNLI, for that we are truly grateful and appreciate all that they have done during their time at Macduff. 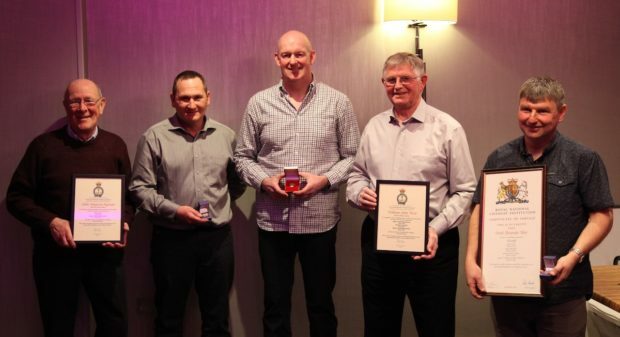 As well as the retirees, crewman Colin Wood, coxswain Chassey Findlay and David Park were honoured with long service medals having been part of the Macduff team for 22, 32 and 24-years respectively. Mr Findlay said while it is nice to recognised for his role, the next generation of volunteers is already coming through. He said: “While this ceremony was about long-service medals and retirements, we cannot go without mentioning all the other volunteers at Macduff who give their time selflessly every week for training and drop everything when the pagers go off. Macduff lifeboat is unique as it is the only RNLI vessel that launches from a mobile crane.